King Neptune was the U.S. Navy's unofficial mascot for nine years during WWII, thanks to Navy recruiter Don Lingle. 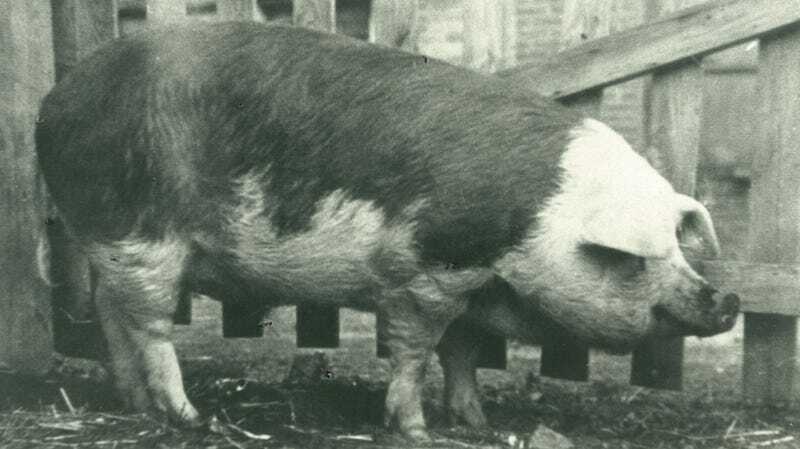 Born Parker Neptune, the 700-pound porker was to be served at a Naval fundraising dinner, but Lingle realized that the pig could be worth more to the military alive than dead. During the early 40's Lingle toured Neptune all across Illinois, outfitting the animal with a blue robe, a golden crown, and silver earrings. The duo would auction off parts of the pig at each and every stop, hawking everything about the animal from his bristles to his squeals. In the spirit of patriotism, high bidders buying the pig at war bond rallies always returned him. At one point the governor of Illinois even purchased the pig for an unheard of $1,000,000. By the mid-40's, the rotund superstar had raised what he could and was sent to the Chicago Stockyards to meet a less than glamourous fate despite his service. However, Lingle was able to regain ownership over the oinker and sent him to live on a farm where the King eventually died of natural causes. King Neptune was given a military burial in Anna, Illinois complete with a headstone honoring his service with the Navy. The original gravestone has since been replaced with a permanent memorial plate which is the least our country could do for a humble beast who managed to raise what would translate to around $200,000,000 by today's standards.